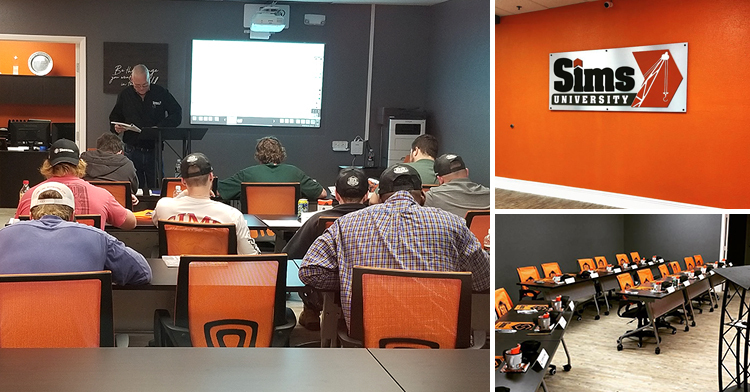 TAMPA, Fla. (April 8, 2019) – Sims Crane, Florida’s premier crane rental and rigging service company, has launched Sims U, a paid, hands-on crane operator training school based in Tampa. The inaugural group of eight students started classes April 1; the semester will end July 19. By the end of the course, students will be expected to pass the CDL Class A driving test, rigger and signalman certification, and a core competency test of their crane knowledge. Sims U classes take place in a new classroom facility that can accommodate up to 20 students with a modular arrangement. The Sims U facility also features two virtual reality simulation stations that allow students to practice the basic functions of crane operations in a controlled, safe, and simulated environment. The simulators use Oculus Rift and allow the instructor to design scenarios focused on specific skills and tasks students may encounter in the field. In addition, Sims U features a green-screen virtual set film studio, which will allow for the production of more educational content for digital learning. Sims says that Sims U is a step toward a larger program designed to better prepare employees to make good decisions each day in their future careers. In addition to pre-apprentice training, the new Sims U facility will host new hire orientation opportunities throughout the year. The most recent new hire orientation was held March 30. “We first tested the new hire orientation concept in October and 30 employees voluntarily travelled from all over the state of Florida to participate. The feedback was overwhelmingly positive and as a result, the new Sims U facility will host regular new hire orientation days,” Sims said. Through the process of developing the pre-apprenticeship Sims U program, Sims Crane also recognized a need for continuing education for existing crane operators. According to Sims, future plans will include developing continuing education courses for existing operators that will include a one- to three-day, topic-focused program designed to update current operators on safety regulation changes, client specific requirements or changes to company policy for best practices that exceed regulatory compliance.